You can visit our Iris reticulata page or browse the pictures using the next and previous links. If you've been inspired take a look at the Iris seeds in our garden centre. This one opened today - it's in a pot in the porch, but there's also one out in the back garden! There should be white ones somewhere too - I can't remember where I planted them! These are lovely. I didn't know the name but I have quite a few in the garden but none are near flowering yet. Which one is it, Alice? Isn't it hard to decide which of these is the prettiest - I can't, certainly! But 'Natasha' is yet to arrive.....however, I have to admit that 'George' is the clear winner at the moment! OK. That would be good! Agree with everyone its lovely. Have you planted any, Carol? What a lovely photograph! this is my favourite of all the iris pics so far this winter, the colour is very classy! Yes, so do I but the birds come and destroy all mine so I've given up now! Perhaps I will grow some in the greenhouse next winter! That's why I had a pot of Iris danfordiae in the greenhouse - not only did the pigeon sit on them, but they pecked them as well - pouring insult on to injury! Oh yes, that's EXACTLY what I said! Henry knows about pigeons - if they land when he's in the garden, he chases them away! YAYYYY!! Go Henry!! If as much as a FLY lands in our garden all hell is let loose! Hmph...Terriers!! I find new plants on GOY and sometimes, later in the year, they magically appear in my garden! LOL. I love this I got one just like it this morning. I love looking for new flowers every day. There are three out now - maybe more tomorrow! Now I remember why I stopped growing them ( see latest comment) the birds eat them, too expensive to feed to our feathered friends, they have the best as it is. (toast with butter the other day)!! Unfortunately the only birds around my house are seagulls pigeons and magpies encouraged by some people feeding them. I wish we had some small birds too. I'm lucky they don't come into my garden but I do occasionally get magpies on the roof 3 doors away she puts bread out on a flat roof. You are VERY lucky - they try hard to get all the food off the bird table, but we have some mesh over the front to stop that. Hee hee! Foiled again! 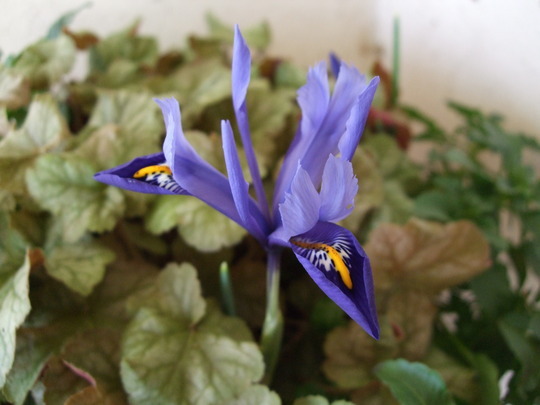 See who else is growing Iris reticulata (Iris).